Luminato is presenting the English-language premiere of La Belle et la Bête: A Contemporary Retelling by multimedia masters Michel Lemieux and Victor Pilon. It is no exaggeration to say that the way Lemieux and Pilon stage the interaction of live actors with projected actors and images is simply astounding. Except for the three live actors and a few physical props, the duo plunge the audience for 90 minutes into an entirely virtual world where anything can happen. Though Lemieux Pilon 4D Art, as their company is known has been producing this kind of multimedia theatre since 1983, the use of projected imagery is particularly appropriate for a fairy tale that is all about appearance and reality. In the original story published by Gabrielle-Suzanne Barbot de Villeneuve in 1740, Belle’s father, a once-wealthy merchant, loses his way in a forest and takes shelter with the Beast. The father plucks a rose for Belle, angering the Beast to such an extent that to save his life the father must promise to give the Beast what is most precious to him – Belle. Belle comes to live with the Beast and discovers he is not so fearful as his hideous appearance would suggest. When she overstays a visit with her father, she sees in a magic mirror that the Beast is dying because of her absence and rushes back to save him. Unlike better-known versions of the story, such as the one used in the 1991 animated Disney film, Villeneuve offers a different explanation of the Beast’s appearance. The Beast was a prince left in care of an evil fairy. When the fairy tried to seduce the prince was reject, she turned him into his beastly form. What makes this stage version of La Belle et la Bête “contemporary” beside its high tech production is that it is set in the present and emphasizes psychological rather than supernatural factors in the character’s relationships. The play is introduced by a character known only as The Lady (played with just the right degree of ambiguity by Diane D’Aquila), who asks, “Who am I?” and “Who are you?” when we hear a story? She claims we always choose the best roles for ourselves, but do those roles really reflect who we are? As an example she examine an enormous blow-up of British-Swiss painter Henry Fuseli’s famous painting The Nightmare (1781), where an ugly troll-like creature sits upon a sleeping woman and a white horse peers through red curtains to look at the scene. Are we the woman, the beast, the horse which represents desire or merely an onlooker? 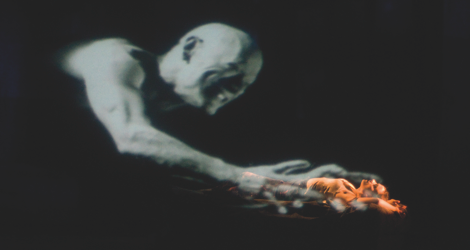 Throughout the production, Lemieux and Pilon fuse the imagery of Fuseli’s painting with that of Villeneuve’s fairy tale. The Belle (a spirited Bénédicte Décary) of their contemporary retelling an independent woman who expresses her grief over her mother’s death in a car accident through her paintings – first drawing a sketch and then hurling red paint over the canvas. Her father and sisters are absent, but her comic sisters (both played in projections by Anne-Marie Cadieux) still pop up in her mind to voice their thoughts. One is twice as tall as Belle and is always negative. The other is half her size and always positive in a foolishly simplistic way. Belle can cause both voices, who function rather like a medieval devil and angel, to vanish into smoke by striking their images with a pail. Belle goes to see the Beast (a fairly stolid Stéphane Demers), not as part of her father’s bargain, but because she has kept back a stone rosette her father carved for the Beast that was part of a set he had ordered. Belle is intrigued to find a man as psychologically wounded as she is, and the Beast is intrigued to find a woman who reminds him so much of the lost love he has constantly been mourning. He wishes to see her paintings and she agrees to return, thus beginning a series of daily visits. The Beast is not a human being with animal features as in the famous 1946 film by Jean Cocteau, but rather a man to has disfigured himself out of grief for his lost love. As the two grow closer, The Lady, whom we thought was merely the narrator, turns out to be the blocking figure, likely the evil fairy of Villeneuve’s tale, and tells lies to both Belle and the Beast to discourage their love. When Belle stops her daily visits because her father has finally returned home, the Beast, as in the fairy tale, begins dying and it up to The Lady whether to send Belle to him to help him live or to let him die. One strange aspect of Lemieux and Pilon’s design is that for their “contemporary retelling”, only The Lady, Belle and the projected image of the Beast before his disfigurement appear in modern clothing. Only Belle’s industrial studio is modern. Otherwise, the design is very like that of Cocteau’s film with the Beast living in an overgrown gothic château whose tendrils reach way out past the second box seats into the audience. Nothing about the Beast’s surrounding is modern which tends to make Pierre-Yves Lemieux’s contemporary dialogue sound distinctly out of place. One wonders why Lemieux and Pilon make such a distinction between the look of the two locations in their “contemporary retelling”. Couldn’t they have retold the tale and left it in the 18th century? After all, that period is well know for psychological novels such as Choderlos de Laclos’s Les Liaisons dangereuses (1782). That criticism aside, this production is a visual feast with one magical scene after another. The vision of a white stallion gallops into Belle’s studio to guide her to the Beast’s château and back. The vision of the Beast’s younger, handsome self steps out of his mirror and the Beast battles wildly with him, with this memory, to accept the person he has become. The Beast’s younger self steals into Belle’s studio while she is asleep to make love to her in what, perhaps, is her dream. The Lady, enraged that she is losing her grip over the Beast, screams and sudden is transformed into the Demon (Peter James) modelled after the creature in Fuseli’s painting. In one particularly stunning scene, the Beast looks through a mirror at the audience and in a fury smashes it send the fragments flying (via projections) right out into the audience. For these visual effects alone, this is a production that any theatre-lover should see because it represents the cutting edge of the use of projection in stage performance. Rather as in movies that use green screen effects, the actors in La Belle et la Bête have been thoroughly trained to interact with images they cannot see. Viewing the show as storytelling, I have to admit I was intrigued to find out the “retelling” would end, but I was never engaged by any of the characters and frankly uninterested in the framing questions put forward by The Lady. As a text, Pierre-Yves Lemieux’s script is both over-explanatory in terms of ideas and under-explanatory in term of story-telling. Wounds as sign of past pain and cherished memories is underscored several times, as is the idea of art as a means of immobilizing time and therefore attempting to stop death. The Lady asks us who she is, and unless you know the Villeneuve version of the tale as opposed to the more commonly known version, you would really have no clue. Perhaps the vagueness between manipulative narrator and evil fairy is intentional, but most people will not know that The Lady could have a key role in the original story. Also, it would be helpful to know more about the Beast’s “lost love”. Was she real or is she just a metaphor, and, if real, how did he come to lose her and why? Despite this, Lemieux Pilon 4D Art is a company we should know much better in Toronto. According to reviews of the 2011 performances of La Belle et la Bête, the show topped anything they has done before. Let’s hope, therefore, that Luminato brings us more of their work so we can better judge their achievements and see their influence on theatre is staged in the future. Photo: Peter James as The Demon and Bénédicte Décary as Belle. ©2011 Yves Renaud.